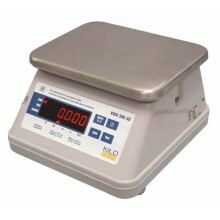 This electronic KCS scale can be used for counting & quantity checking. 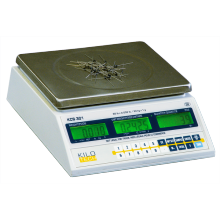 Ideal for use in factories and warehouses for testing and sampling, check-weighing in packaging operations as well as quality control. Rechargeable battery provides greater flexibility when movement to various work areas is required. Target feature ensures accuracy and increases efficiency by alerting the operator when the item count is achieved. 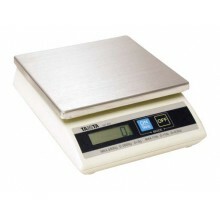 All-purpose electronic portion control scale. Ideal for use in salad bars, restaurants and brew-it stores for portion control, warehouse and production areas for testing and sampling purposes, as well as in shipping and mailing applications for postage & weighing accuracy. Sleek design facilitates placement on crowded counters. Time saving kg/lb. conversion key. Removable and washable steel platter allows for fast clean-ups. Easy to operate. Dual power source (AC adapter or battery) gives greater flexibility when movement to various work areas is required. 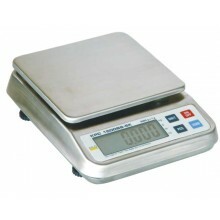 Convenient tare feature lets you deduct the weight of the container, providing net weight only. Built tough for warehouses - Testing, sampling, mailing and shipping. Simple controls - Time saving 3 mode toggle keys. Built tough - Stainless steel platter & body. Easy viewing - Large digital display with auto backlight. 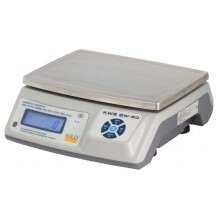 Time saving features - Let your scale do the work for you with features such as TARE, counting and zero. 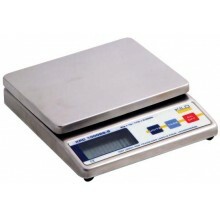 Portable No need to plug in the scale… 12 hour rechargeable battery. Accurately weigh as you pour - pouring function. For high humidity and dusty environments - IP66 rating ensures a long life. Less cleaning, faster measuring, and more precise. Display for both consumer and operator - A must have for selling by weight.